I remember the morning I first met Sunni the bride and her mom Tammy, we met at a local trendy coffee shop called Barista Parlor in Nashville, Tennessee. This was our first meeting. I recall them walking up, both with giant smiles on their faces as they were about to embark on the journey off planning a wedding! They were excited and ready to plan the day Sunni was going to marry her handsome groom, Gunnar, and wanted it to be perfect! Both Sunni and Gunnar are heavy involved in the music industry, with Sunni running and artist management agency and Gunnar just releasing his first single "Forever Sounds Good to Me" Gunnar and the Grizzly Boys. 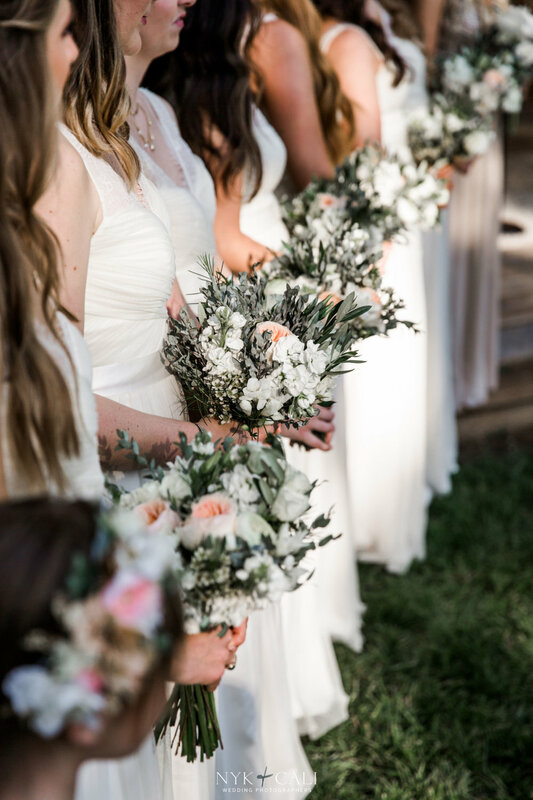 This wedding needed to be hip, cool, rustic, elegant and unique all wrapped up together. I remember Sunni explaining how she wanted, leather, lace, wood, and steel all to be equally part of the design. She had a Bohemin flair with undeniable elegance. We were excited to began the creation. Sunni had booked a venue, Saddle Woods Farm. 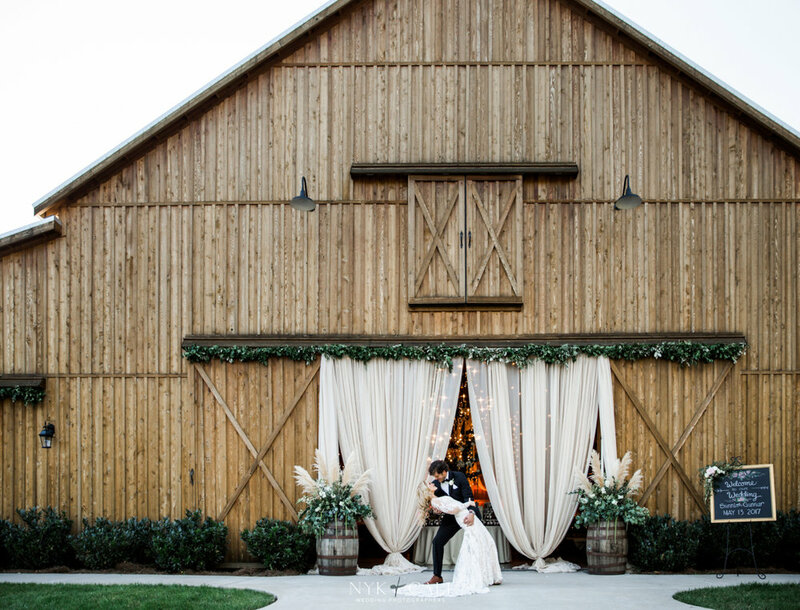 It is a beautiful barn located just outside of Nashville. This was the perfect pallet to create this stunning event. First things first, she had to find the perfect dress! We sent Sunni straight to Amanda Oberhaus at POSH bridal Couture! Amanda always takes such good care of our clients she adds a special touch to the experience. I knew she would help Sunni find the perfect dress, and she did just that! Sunni chose a beautiful dress designed by, Madison James. The illusion back of this sleek lace gown is accented with graceful floral appliques and trailing buttons" simply stunning! Laurie D'Anne Events is a custom design company. We take our time letting the event evolve based on the clients vision. Custom designs grow, beginning with the vision the bride has for her wedding day and the creative ideas of our team, and together we create MAGIC! I love working with clients that trust the process. Sunni did just that! She gave us the basics and let us run with it, creating the perfect day! The ceremony was to be held outdoors under a structure that set in the midst of tall trees around the structure. It was beautiful engulfed wth florals graceful hanging overhead. Sunni had mentioned that she wanted vintage rugs to line the center of the aisle. So we set out to find s collections of vintage, Azteca styled rugs And I called in Alina at Petals and Fields in to help collaborate the floral design. Together we created the perfect ceremony site for this couple. Like all good parties its important to keep your guests engaged. 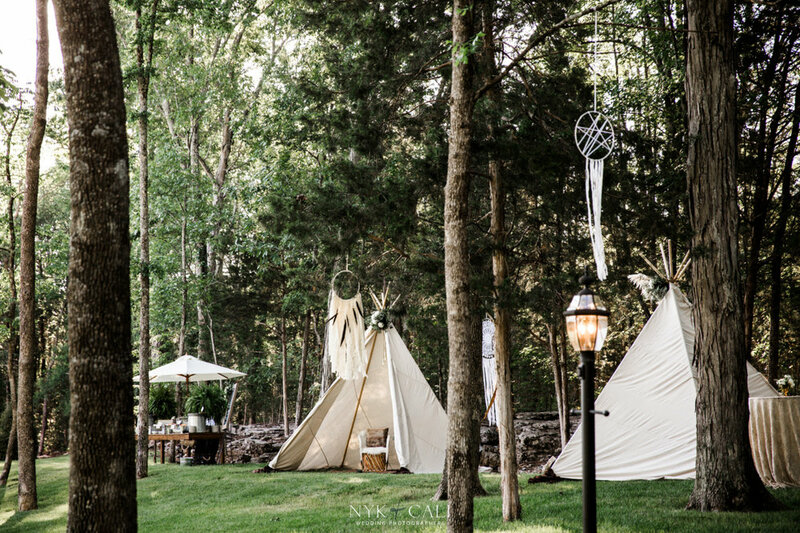 We used this hour immediately following the ceremony to WOW the guests with these Tepee's created by Nashville Audio Visual, and custom made for our event. The second thing we knew we had to have was incredible food! Not just good food, but food that would knock the socks off of their California, Michigan and Nashville guest. And we did just that. We chose to work with Chef Burke at G'Catering who created a culinary experience, from a sculpted Raw Bar during the cocktail hour to Street Tacos, and more for the reception, each stations authenticity and culturly displayed creating a culinary experience. This goal was to create a relaxed comfortable relaxed setting. Sunni and Gunner wanted to be able to enjoy their guest and their guest to enjoy the party! 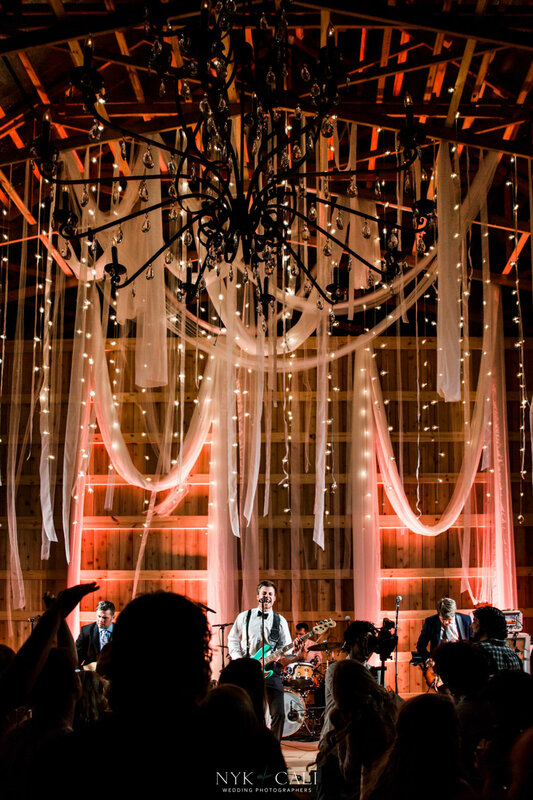 A great band , fantastic food and great lighting that would created the prefect atmosphere to host their guests. 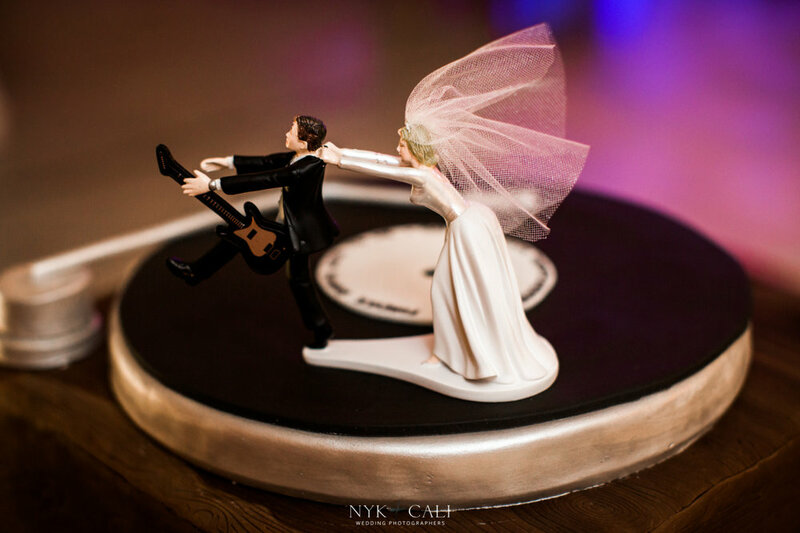 Enjoy as you browse trough these beautiful photos take by Nyk and Cali Photography. Notice the details of this wedding from the furs on the benches, to leather table accents, and wood everywhere. We loved designing this event! Each element was customized just for Sunni and Gunnar. From the moment I met Sunni and Gunnar I knew this event was going to be spectacular! We couldn't be more happy with the end result. Laurie D'Anne Events creates custom events for our clients. It is a privilege to create experiences for you and your guests. Come let us create the perfect wedding setting day for you and your guests!